Alright, I admit it, I may have a handbag problem. Fresh after buying a new Michael Kors Hamilton in Vegas I couldn’t resist the urge and I bought Rebecca Minkoff’s Mini MAC bag. To be fair, I have wanted this bag for awhile and it was on my wish list. Plus, I got it on sale. This bag is uber-popular in the YouTube world with basically every beauty guru I can think of picking it up. I got mine because I don’t have a small bag except for my Chanel WOC which was was very expensive for everyday use, so I wanted something more casual to sport around when I don’t want to carry a lot of stuff, which is basically all the time because I usually just bring my wallet, cell phone, keys, and a lipstick. 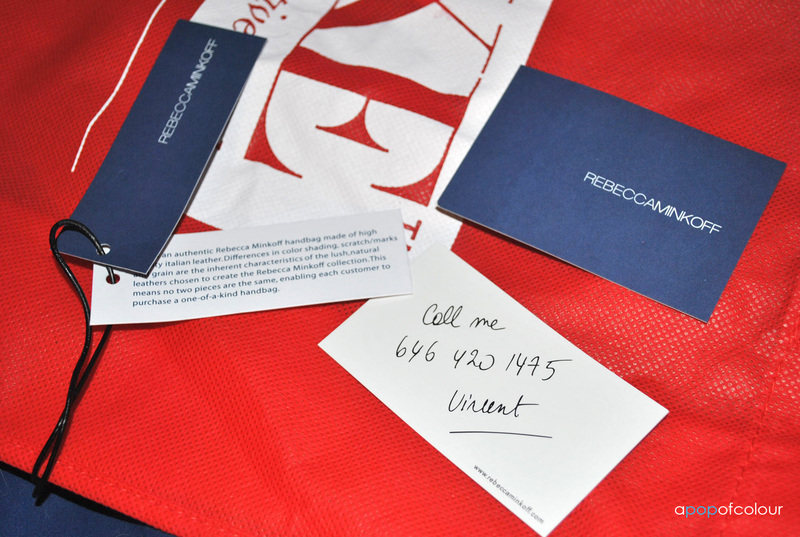 The Rebecca Minkoff Mini MAC (which stands for Morning After Clutch – the bag actually comes with a fake business card with “Vincent’s” number on it) is the baby version of her MAC clutch. Whenever I see this bag on YouTube they always mention how small it is, however, when I checked it out in person at Nordstrom in Las Vegas it was considerably larger than I thought it was (I actually thought it was the MAC clutch, and then I saw the MAC a few minutes later and honestly, I think that bag is huge). The dimensions on the Mini MAC are 8 inches in height, 11 inches in width, two inches in depth, 46 inches in strap length. 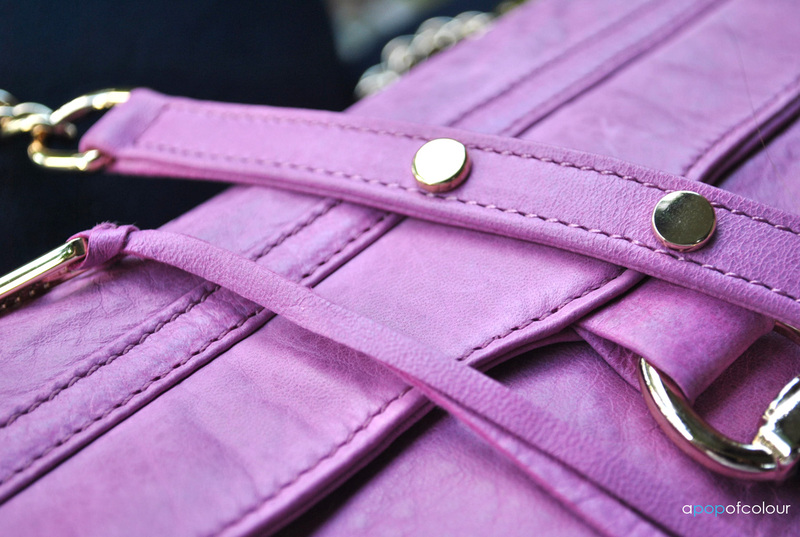 The brand offers this bag in a variety of colours depending on season. 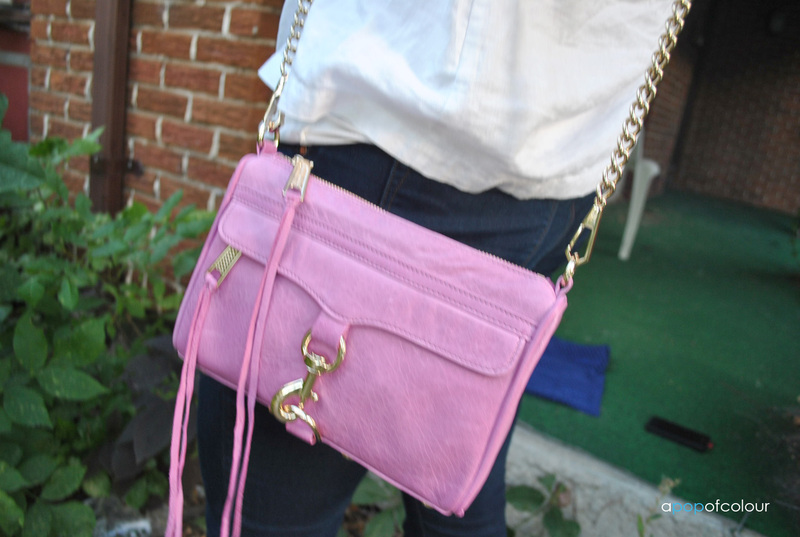 I got mine in the colour Pink Iris, which is a beautiful lavender colour, with light gold hardware. This shade was actually on sale (that’s why I bought this colour) for C$169.25 down from $225 on eLuxe.ca. They also had the hot pink colour on sale for the same price but I thought this shade would be a little more versatile and not as trendy. Of course she offers this bag in your everyday typical colours like black and brown, but depending on season the shades are switched up (for example, for fall 2012 she is offering this bag in burgundy, sage, smoke, taupe, royal (blue), teal, lipstick (red), and orange). I’m not sure which season my bag is from but it looks like a spring colour. As for hardware, depending on the leather colour, it can come with either gold, silver, or rose gold. As for style, I love the look and feel of the bag. 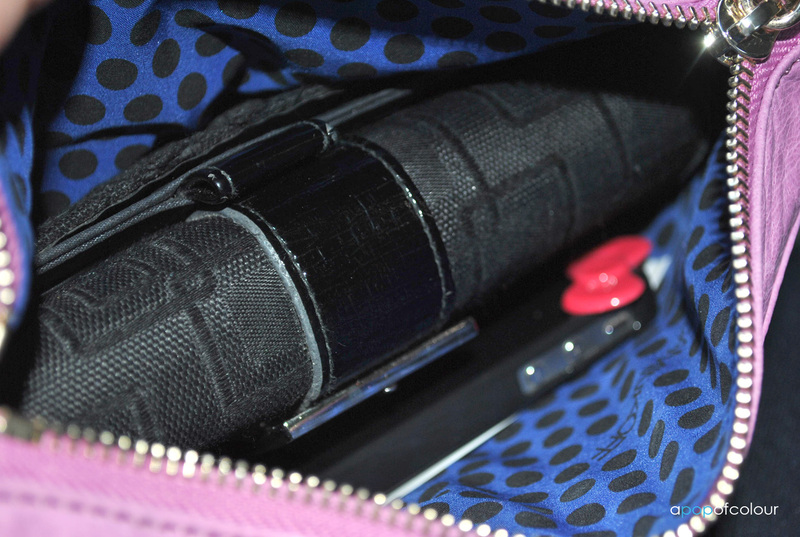 The purse features two zippered compartments, a main one and a front pocket which is concealed by the latch and flap. It also has extremely soft Italian leather, which I hate to say, for the lighter coloured bags (like mine) I feel that dyes would rub off on it (I’m totally expecting denim to rub off leaving a blue dye on my bag – I’ll have to be extra careful that it doesn’t rub against my clothing). There are other minor details I absolutely love like the polka dot lining which matches the dust bag, and the Balenciaga-style leather tassels attached to the zipper. As for how much stuff I can pack in here, this bag fits a lot. I was really expecting to only carry my Michael Kors card case that I got in Vegas, plus a lipstick, phone, and keys, but honestly, I can fit my entire wallet and the rest of the items mentioned above. For a bag that is advertised as being small, this thing carries a lot. Also, for my model (which must be a newer one) there are no inside compartments. I was watching a few YouTube reviews on this bag and theirs feature a few compartments in the lining which most people found useless and annoying, for they just got in the way. The lining pattern is also switched up by year I believe, as I know last year she offered this bag with a leopard-print lining. So final thoughts on the Rebecca Minkoff Mini MAC, I would recommend this bag if you are looking for a quality handbag that carries the essentials. It is a little pricey at C$225, $195 USD, but look for it on sale. If you are in Canada, make sure you check the sale section on eLuxe.ca regularly as that’s where I found mine (you can also find this bag at Holt Renfrew, but the chance of finding it on sale would be slimmer I would imagine), and if you are in the U.S. wait until online stores (Shopbop, Nordstrom, Bloomingdales, etc.) have their Friends and Family sales where you can save anywhere from 10 to 25 per cent off. I also bought the bag through Ebates, which got me four per cent cash back on my purchase (check out my post on Ebates here). Also, because this bag isn’t by a luxury designer, Rebecca Minkoff is usually included in most store discount events. If you have the money to spend and if you love the look and style, I would definitely pick it up. Like I said, I don’t think it’s as small as most people make it out to be and I think that everyone should have a small bag in their collection; they just come in handy. I bought my Rebecca Minkoff Mini MAC through eLuxe.ca, which is like a Canadian version of Net-a-Porter, but without the expansive brand selection. The e-Commerce site sells brand name contemporary designers like House of Harlow 1960, J. Brand, Michael Kors, etc. The best part about them is that they are a Canadian company, so you aren’t paying expensive duty fees if you are a Canadian like me. In addition, they also offer incredibly fast shipping (which is free when you spend of $25) and everything is quoted in Canadian dollars. My bag came via FedEx the day after they shipped it. This was the first time I have ordered from eLuxe.ca and I was extremely satisfied with the service. It was a smooth transaction and they got me my purchase in remarkable timing. They do offer expedited shipping for a fee, but honestly my parcel came after one day and I live in the centre of Canada (they are located in Toronto), so I would just stick with the free regular shipping. I also liked the little details that truly made up the whole experience. My bag came in a large FedEx box, which when I opened it I found a huge reusable shopping tote from the company. In the tote was my bag, a Canada Post bag envelope and pre-paid label for returns, and an envelope with my bill, a sheet on FAQs, and a $10 gift card to spend at well.ca which unfortunately expired on August 31, 2012 (my order receipt was dated on September 3, 2012, so I bought my bag after the gift card expired which was a little disappointing). The Mini MAC was wrapped up pretty tight in a polybag and there was a little tag attached to the handle of the bag from eLuxe.ca that said that returns will only be accepted if the tag remains attached. eLuxe.ca puts a lot of effort into the whole experience of shopping with them and because of those little details, I would totally order from them again. eLuxe.ca is actually offering $10 off when you sign up for their newsletter (Sign Up for our Fashion Alerts and Get $10 Off ), so if you are from Canada and are interested in buying the Rebecca Minkoff Mini MAC, you can get $10 off your purchase, plus four per cent cash back through Ebates. UPDATE February 7, 2013: Want to get $100 off a Rebecca Minkoff Mini MAC? 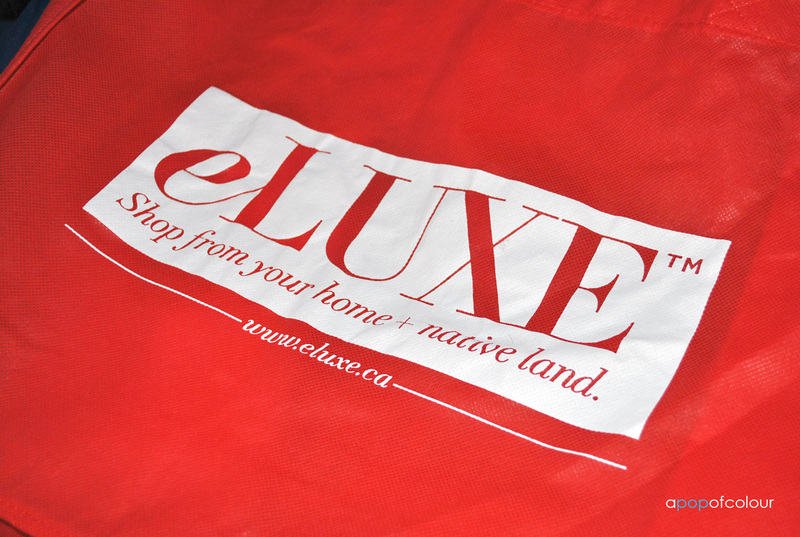 Head on over to eLuxe.ca’s Facebook page and enter your email to receive $50 off any purchase of $100 or more. Or, if you get four friends to sign up (just enter their email addresses) you can get $100 off $200 or more. I’m not sure how long this promo is going on for, so jump at it if you can! 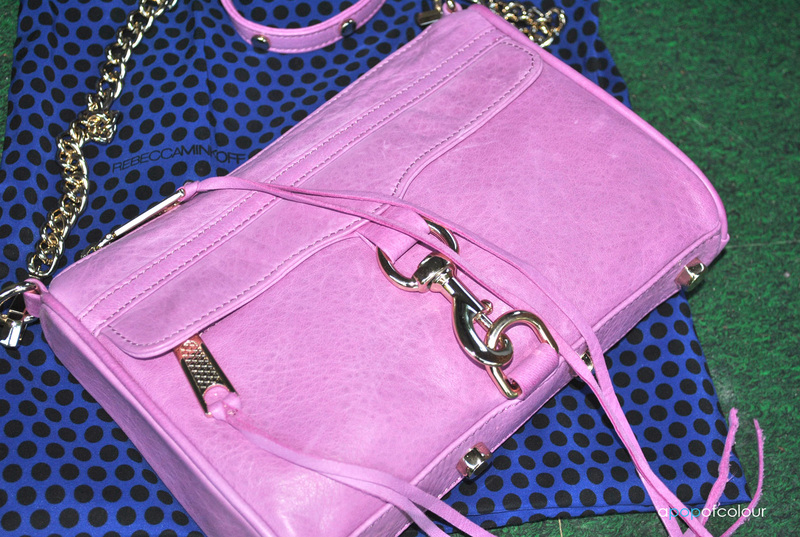 Do you own a Rebecca Minkoff Mini MAC clutch? If so, what are your thoughts?